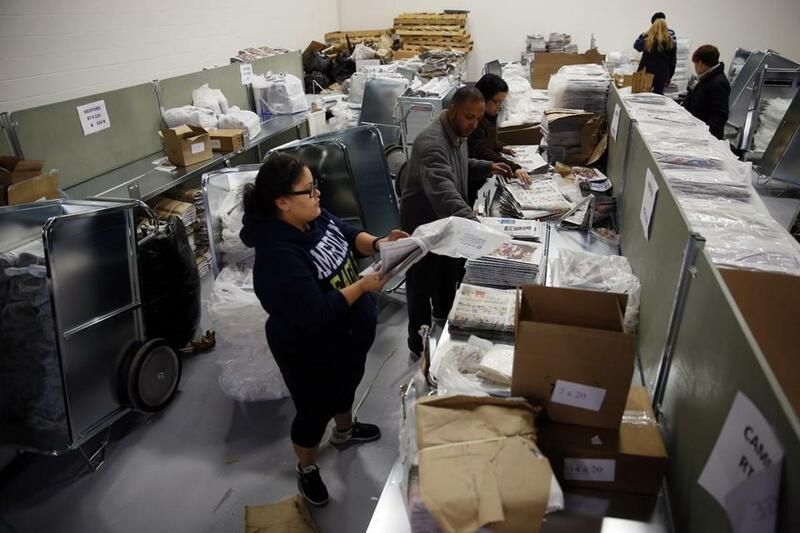 Workers bundled papers inside a distribution center in Woburn before they delivered the Sunday Boston Globe. How hard can it be to deliver a newspaper? By now, we’ve all learned that it’s not that easy. Judging by the extent of our delivery woes under a new distributor, you might think executives thought anybody with a car could toss a paper on a driveway and call it a day. Behind the Globe delivery debacle is an inconvenient truth: As much as we think of ourselves as a digital-first, multimedia organization, we are an old-line manufacturer that relies on a hub-and-spoke distribution model for a product that still generates most of our revenue. It’s a complex business that straddles both the old and new worlds, from pressmen to programmers, from reporters to drivers, all the while pleasing customers. We have an old saying in newsrooms: Putting out the paper is a daily miracle. I used to think that was just about filing your story on deadline, but I’ve come to appreciate how it’s the whole package from keyboard to doorstep. The idea of switching vendors came from a practical notion: With half of the subscribers who cancel their paper citing delivery issues, it was time to find a better option. We recognize that you depend on us, and that we’ve let you down. We’re working around the clock to solve this. Where the paper’s management failed miserably is in execution. You don’t need an MBA to figure that out, but just for kicks I picked the brains of b-school professors on what went wrong and what the Globe could have done right. Consider this a case study on how not to deliver a newspaper. ACI Media Group became the Globe’s main delivery vendor on Dec. 28, and from the get go, there were problems. The company hadn’t hired enough drivers and logical routes weren’t mapped out. Thousands of subscribers did not receive their papers, day after day. Then frustration grew into anger when customers flooded Globe phone lines to complain about missed papers but could not get through. Lesson #1: Trust but verify. Globe executives will tell you they relied on their vendor getting it right. They trusted this outfit so much that the Globe contract did not include financial penalties for the first two months related to poor performance. Ugh. Even managers at the MBTA knew to do that when they switched over the commuter rail contract. Herein lies the problem: When things go wrong, customers don’t blame ACI, they point fingers at the Globe. We suffer the consequences. Hammond said in any major transition companies need to put their new partners to the test before a rollout. The Globe should have done a lot of computer simulations of ACI’s routes and should have driven some of the routes to see if the new vendor’s mapping software worked. ACI, based in Long Beach, Calif., had not delivered papers in New England before and has told the Globe that their software didn’t work as well out here. Lesson #2: Take small steps. Even as more readers get the news online, print advertising still pays the bills around here. Home delivery customers shell out more than $700 a year to have papers brought to their doorsteps. It’s unfathomable Globe managers handed such an important part of the business to a contractor that had no track record here. What would have been smarter is to keep the old vendor, Publishers Circulation Fulfillment, and then give a chunk of the distribution to ACI to places where PCF struggled. It’s probably something the Globe wanted to do but such an agreement proved to be difficult to negotiate. “Something of this scale, I would always pilot it,” said Hammond. But after a disastrous start, the Globe and ACI on Tuesday afternoon struck a deal to bring back PCF and split the distribution. PCF will begin delivering the paper again on Monday. Lesson #3: Get it right the first time. When it was clear ACI wasn’t ready, Globe management should have tried to delay the changeover. The paper had warned subscribers of possible disruption of service, but did not anticipate the extent of missed or late deliveries. Now the Globe faces backlash from customers who are threatening to cancel their subscriptions. “In logistics, fixing problems is much more expensive than when things were done right the first time,” said Sharmila Chatterjee, who teaches customer service management at MIT Sloan School of Management. It’s more than money lost here. It’s pride. I’ve been at the Globe for more than a decade, and I thought I lived through its worst moments when then-owner The New York Times Co. threatened to shut down the Globe in 2009. But it was different then. We knew who the enemy was, and readers rallied to our side. This time the Globe is suffering a self-inflicted wound. Managers were well-intentioned in trying to improve customer service and save a little money, all to retain subscribers so more profits could be plowed back into the journalism. It’s time to learn from our failure and make it right.